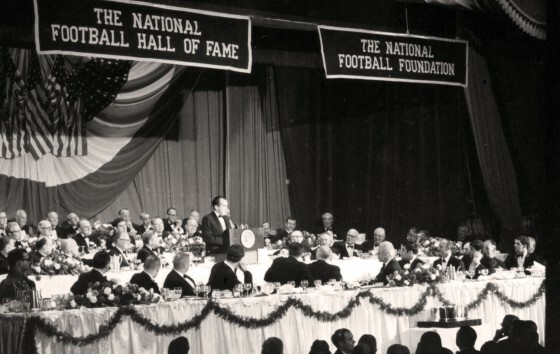 On the 100th anniversary of American football, President Nixon was awarded the National Football Foundation’s Gold Medal, the highest individual award bestowed by the Foundation in recognition of outstanding Americans who have contributed significantly to the sport of college football and country. Though President Nixon was neither a standout or starter on his college football team of Whittier, there was no greater fan than Richard Nixon. I can only say that as far as this award is concerned, that it is certainly a small step for the National Football Foundation and a small step for football, but it is a giant leap for a man who never even made the team at Whittier. To President Nixon, football meant far more than entertainment–he credits his time playing high school and college football as a time that instilled in him a “competitive spirit and determination to come back after you have been knocked down or after you lose.” His coach in college at Whittier, Wallace Newman, particularly made a strong impression on the future Commander-in-Chief. More than anything the “Chief,”–as players referred to him–a proud American Indian, taught RN that character above all else is what truly matters. Football, above all else, shaped RN’s character, especially his political resiliency. RN recognized the great players, coaches and teams that stretched his memory–Bud Wilkinson, Ernie Nevers, the great college football programs of Ohio State, Notre Dame, Southern California, among others–and shared his fondest memories of pivotal games. He also recognized the great passion that football bred among all types of people, most notably so whom who thought were the three great presidents of the 20th century. Woodrow Wilson, the tremendous scholar; Theodore Roosevelt, the extrovert, writer, explorer; and Dwight Eisenhower, the great general–they all had one thing in common, and that was the love of football. What does this mean, this common interest in football of Presidents, of leaders, of people generally? It means a competitive spirit. It means, also, to me, the ability and the determination to be able to lose and then come back and try again, to sit on the bench and then come back• It means basically the character, the drive, the pride, the teamwork, the feeling of being in a cause bigger than yourself.